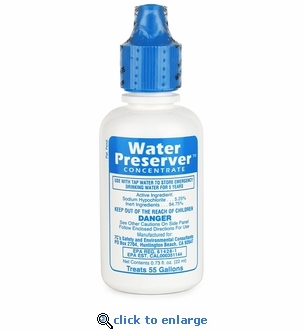 Water Preserver™ Concentrate disinfects, preserves and extends the storage life of emergency drinking water. 1 bottle of preserver treats up to 55 gallons of tap water. Water Preserver™ provides guaranteed 5-year storage for regular tap water or commercial bottled water for long term emergency preparedness. Water Preserver™ Concentrate can be used in any containers or drums suitable for drinking water storage. Easy to follow directions included with each bottle. Use only as directed. Allows ordinary tap water to be stored for up to 5 years. 1 bottle of preserver treats up to 55 gallons of tap water. Kills bacteria, viruses, mold and funguses in water. Eliminates having to replace water every 3-6 months! Proven over 12 years of testing and use. U.S. EPA, And State Registered; Safe And Effective. Water Preserver™ is the #1 recommended product of emergency professionals. Water Preserver™ kills, and prevents the re-growth of Coliform bacteria and other disease-causing microorganisms for 5 years, when used as directed. Water Preserver™ kills the pathogenic organisms responsible for typhoid, dysentery and other serious diseases, and also kills and prevents growth of yeast, mold, fungi and algae which also make water undrinkable. TESTING AND APPROVALS Water Preserver™ was laboratory tested for 10 years in a program of continuous sampling analysis to ensure its effectiveness. Laboratory test results were monitored and evaluated by the California State Environmental Protection Agency (Cal/EPA). Both U.S. and state EPA have licensed Water Preserver™ as effective for 5-year water storage. ACTIVE INGREDIENTS Water Preserver™ is manufactured specifically for long-term water storage. Water Preserver™ is a proprietary formula of high-purity ingredients blended to produce a highly effective form of Sodium hypochlorite, that is stabilized and pH balanced, and has residual bactericidal properties. PRODUCT SAFETY Water Preserver™ belongs to a family of disinfectants associated with water purification and the safe anti-bacterial treatment of drinking water for over 100 years. Water Preserver™ is manufactured at an EPA registered site under controlled conditions, then laboratory tested, safety sealed, and date-coded to insure potency.